FILE - Turkey's Central Bank headquarters in Ankara. International investors are looking to Tuesday's meeting of the Turkish central bank as a critical test of whether the bank can remain independent of President Recep Tayyip Erdogan, his increasing powers, and what some criticize as his Islamist agenda. The Turkish currency has fallen sharply as concerns mount on whether he will impose unorthodox economic policies on the bank. Erdogan, who has called for Islamic banks to make up a quarter of the country's banking sector, strongly opposes interest rates and has described them as "the mother and father of all evil." The president rejects economic orthodoxy that increasing rates reduces inflation. Investors are looking to the Turkish central bank meeting to hike rates to rein in rampant inflation, currently running at over 15 percent — among the highest in the developed world. "If the central bank cannot find the opportunity to hike, then the markets will take it very negatively," economist Inan Demir of Nomura Securities said. "If it can hike then the market will see this as the first market-friendly action by the new administration." Investors' concerns saw the Turkish lira plunge about 30 percent since the start of the year. Adding to the unease is Erdogan's move to assume sweeping executive powers after last month's presidential elections. FILE : Turkish President Tayyip Erdogan's son-in-law and newly appointed Treasury and Finance Minister Berat Albayrak attends a news conference at the Presidential Palace in Ankara, Turkey, July 9, 2018. During his campaign, Erdogan pledged to take greater control over the economy, including the independent central bank. The appointment of his son-in-law, Berat Albayrak, as Turkey's finance minister has further raised international investor concerns. In the past, Albayrak voiced support for Erdogan's stance on interest rates. The new cabinet announced earlier this month saw the removal of Mehmet Simsek and Naci Agbal, who investors saw as strong advocates of orthodox economic policies. Uncertainty over the outcome of Tuesday's central bank meeting is fueling investors' fears that Ankara could adopt radical new measures to prevent capital from leaving the country. "Investors are starting to ask if capital controls will be imposed," Demir said. "If there is no monetary policy to counter the lira depreciation by the central bank, then investors will start to assume worst case scenario, the capital control scenario." "Such a fear," he continued, "will mean an acceleration of capital outflows out of the country, which would bring capital inflows to the fore, so there is the risk of a self-fulfilling prophecy." 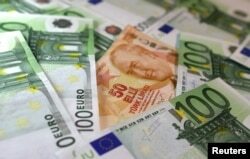 FILE - Turkish Lira and Euro banknotes are seen in this picture taken June 25, 2018. Turkey’s is borrowing more than $15 billion monthly from global markets to meet its financial obligations. Analysts warn capital controls would be tantamount to economic suicide, killing Turkey's credit rating and thus its ability to borrow the $5 billion a month it needs to cover the shortfall of its current account deficit, or the difference between what it imports and exports. In the past few days, Albayrak has sought to ease investor concerns by stating support for the central bank. "We aim for an effective central bank. The central bank sees and builds the fiscal life in a correct way. Turkey will never again be this attractive for foreign investors," he said Sunday. 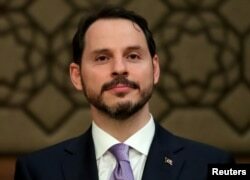 Albayrak, accompanied by internationally respected economic experts, met Monday with his counterparts from countries at the G20 meeting of finance ministers in Buenos Aires, where he underscored his message that Turkey remains market-friendly. Erdogan has also refrained from visibly advocating his opposition to interest rates, a move seen as helping investor sentiment. But analysts warn actions, not words, will determine how financial markets will ultimately react towards Turkey. If the central bank does hike rates it could enhance Albayrak's reputation among international investors, some analysts say. "He can correct his own image going forward," said Demir. On the other hand, with Turkish interest rates already among the highest in the developed world at over 17 percent, a further hike will likely bring problems. "[Turkish] private banks are already not adding to their loans because they realize at these rates, repaying will be very difficult," political analyst Atilla Yesilada of Global Source Partners said. "That is going to hit economic growth." Both Turkish consumers and companies are already heavily indebted and economists predict a severe economic slowdown — if not a recession — by the end of the year. Analysts warn even if the bank were to raise interest rates Tuesday and Erdogan were to abandon his unorthodox economic policies, investors would be looking for Ankara to do more to rein in public spending and avert a dramatic slide. "The problem now is discretionary spending on mega projects, welfare projects which are simply not bearable, this needs to be corrected," Yesilada said.